Nice game! I liked the power-ups and the different sea creatures! With some polish, this seems like it could be a great game! Thank you! I plan to continue working on this game, and it will definitely get more polish. The title screen is very pretty! It made me think I was about to play a great story-centric RPG, probably due to the cliché that's been established in a mystical night sky to associate with JRPGs from my experience. (Western too, I suppose). It was pretty good for a sidescroller! I liked how your enemy variations were inspired by the creatures in real life, such as the star fish. Thanks! The main idea for this game was to be a shooter with sea creatures, but in space, and I'm glad you noticed! You brought up an interesting point with the menu though. I may need to change it a bit so it fits better with the style of the game. Thank you! 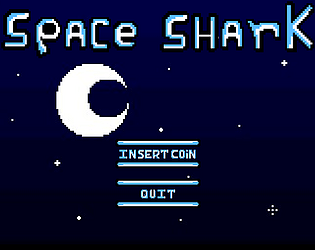 I'll admit, the title screen (not including the credits) is probably the best thing about the game. I was also really glad with Cosmonaut's music, though if we continue working on the game, (which I probably will,) then I'll likely replace the music for the rest of the game with something that fits.